Fairy circles: What’s your theory? 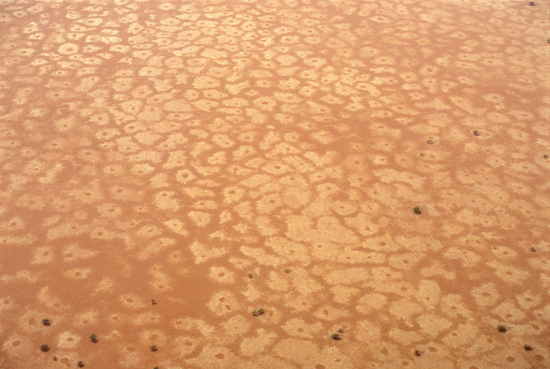 The fairy circles of the Namib – those bizarre patches of circular bare ground dotting desert grasslands – have probably elicited wider speculation than any other natural phenomenon in Namibia. Ranging from the highly esoteric to the downright mundane, from the deeply scientific to the purely fanciful, theories and assumptions abound. While some believe that they have found conclusive answers, the world’s first Fairy Circle Symposium showed that even the experts can’t agree – at least not yet. 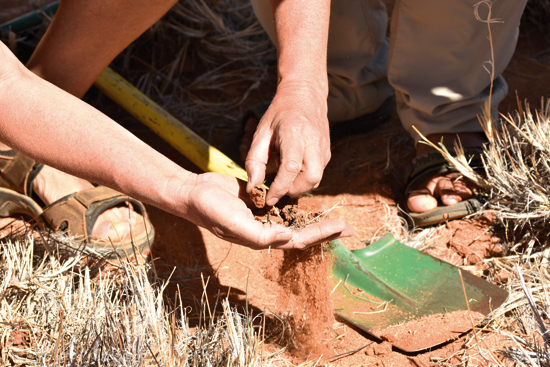 Twenty-eight fairy circle enthusiasts, most of them distinguished scientists with published work on fairy circle dynamics, came together at Wolwedans on the NamibRand Nature Reserve in the last days of February to share and discuss research results and hypotheses. Hypotheses because, even though fairy circles have received focused scientific attention since the 1970s, no results put forward to date conclusively prove the cause of the phenomenon. 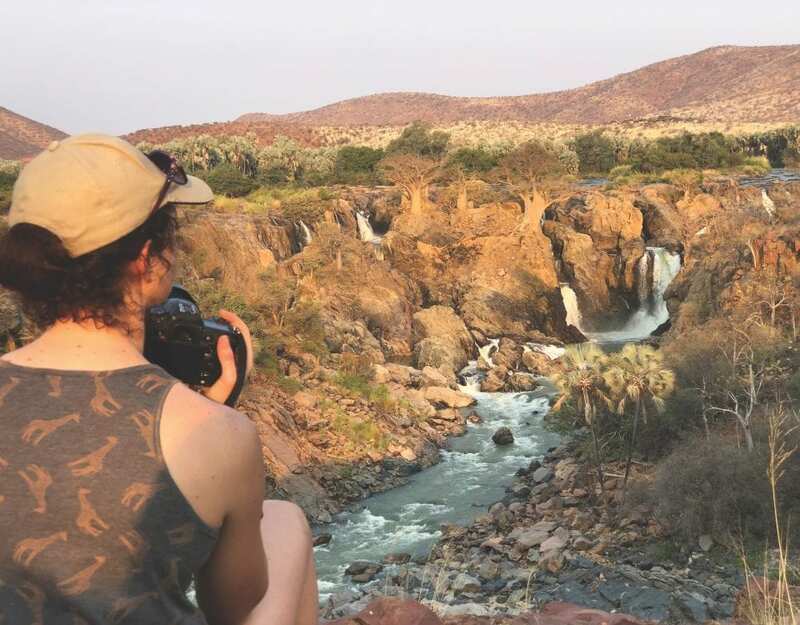 Namibia offers many natural wonders. Spectacular landscapes and stunning geology. Fascinating climatic conditions and unique ecological processes. Strange plants and enigmatic animals. Even some of the world’s largest bacteria. Within this illustrious assortment of oddities and wonders, fairy circles are among the most mysterious. They are obvious for all to see, yet cannot be easily explained. 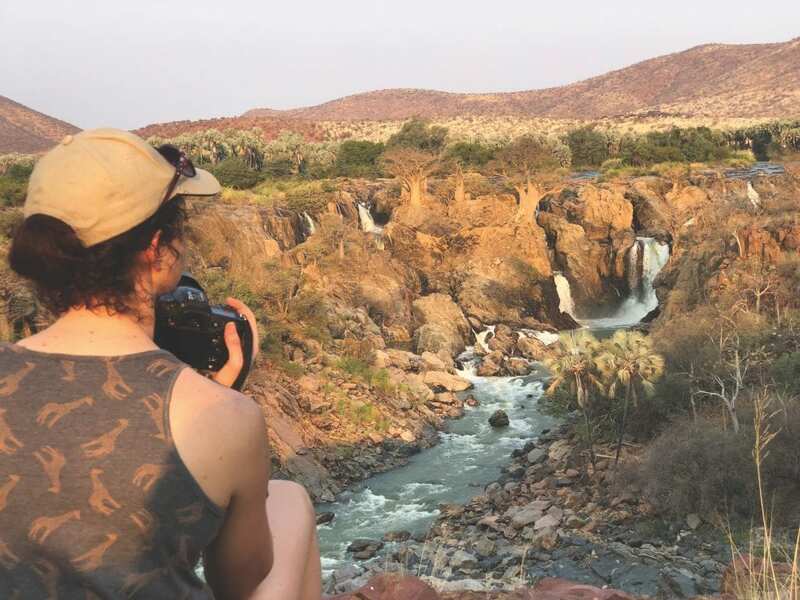 They occur in some of the most picturesque parts of Namibia and dominate entire landscapes, yet their distribution is patchy. There are distinct fairy circle ‘hotspots’ in the NamibRand and Dieprivier areas of the southern Namib, in the vicinity of Namibia’s highest mountain, the Brandberg, and in several locations in Kaoko in the far northwest. From other areas where one might expect them, they are curiously absent. Fairy circles are fascinating to look at. From the air, they can be seen blanketing entire landscapes in their thousands. At ground level, mysterious details become apparent. They are an enigma of the natural world. Scientists from around the globe have been studying them for over forty years. A wide range of experiments has been conducted, many using highly sophisticated technology. Research ranges from extensive mathematical modelling to explain the large-scale patterns that are created by the circles to the physical search for any organisms or poisons that might be causing the grass to die and the circles to form. An incredible wealth of data has been amassed. And yet the full complexity of a seemingly simple patch of bare sand remains unexplained. Only a handful of causes are still being seriously discussed and explored – that living organisms (insects, fungi, bacteria) are killing the grass; that poisonous compounds (natural gases, toxins) are responsible; or that competition for water and nutrients (often called self-organisation) is creating the circles. No evidence has yet proven incontrovertible. Fairy circles are most common along the edge of the Namib Desert where the average annual rainfall is around 100 millimetres. The circles are most abundant in Stipagrostis grasslands on sandy ground. Individual circles have a cycle of formation, decline and disappearance. Some circles remain unchanged for decades; others come and go within a few years. The sand inside the circles is significantly moister than the surrounding sand. Various natural gases have been shown to occur in higher concentrations inside the circles. A fringe of taller grass often grows along the edge of the circles. In some areas, thousands of circles cover entire landscapes. The circles have been studied by dozens of scientists from different countries for more than 40 years. No research carried out to date has conclusively identified one cause for fairy circle formation. The most commonly postulated cause – termites – has been explored in many variations. The most recent version of the general hypothesis, published in 2013, is based on a wealth of data collected over many years from different areas. The theory suggests that a particular termite species, the sand termite (Psammotermes allocerus), creates a favourable local ecosystem for its colony by actively clearing a circular area of all grass to create a water reservoir. Moisture from sporadic rains is stored in the soil and, because it is not consumed by plants, creates a more hospitable microclimate for the termites than the surrounding desert. In effect, one of many examples of adaptation to extreme environments by animals and plants. Yet this postulate, like so many others, has been emphatically refuted by a number of fairy-circle researchers from different disciplines. Thus, the Fairy Circle Symposium came at an opportune time. Over the years, the idea of getting together as many as possible of the scientists who have studied fairy circles had been repeatedly suggested. 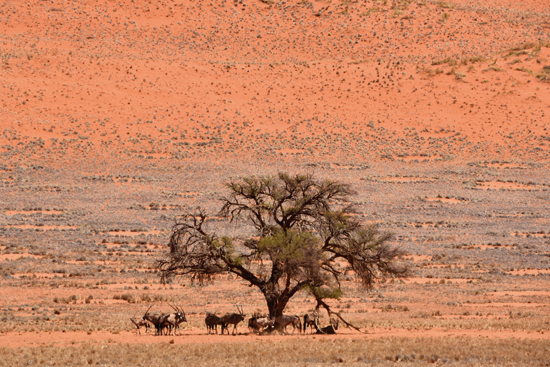 The NamibRand Nature Reserve, a private reserve covering over 200,000 hectares of prime fairy circle landscape and one of the most breathtaking parts of our country, has been the study area of much of the fairy circle research carried out to date. 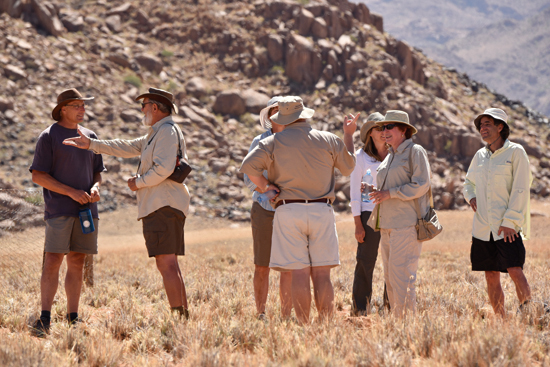 With a variety of great accommodation options and a dedicated research centre, NamibRand provides ideal conditions for research – and for a symposium. The reserve management, in partnership with the management of the main tourism concessionaire, Wolwedans, took the initiative, contacted all the people and organised the symposium. To their credit, most of the invited fairy-circle scientists came – knowing full well that their work was going to receive intense scrutiny from critical peers. Only a few researchers with published work related to fairy circles were unable to make it. The first day of presentations and discussions was a mind-boggling barrage of information on many different aspects of the phenomenon, followed by half a day of fascinating field visits and research demonstrations. Throughout, there were plenty of passionate discussions, as well as quiet, informal exchanges over good food and drink. Cautionary wisdoms such as “correlation is not causation” put the difficulty of pinning down the definitive cause of fairy circles into context. 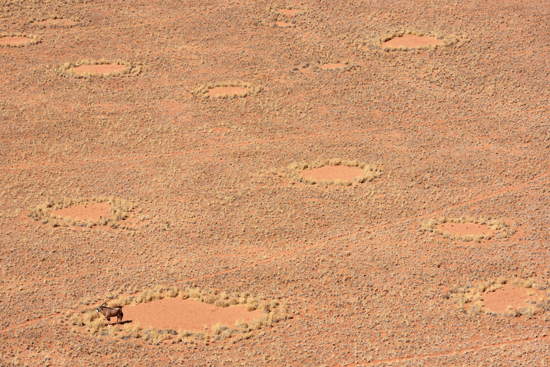 Importantly, to stand any chance of being widely accepted, a theory has to explain and physically prove all – and not just some – of the characteristics of fairy circles. It appears that a complex chain of interconnected factors may be at work here and the symposium was excellent in sharing research and postulates around a great variety of elements, by bringing people face to face. While plenty of disagreement remains, scientists were already envisioning joint experiments and are looking forward to closer collaboration. The symposium was seen as a historic event. It was a great event for Namibia, for science and for the wonders and complexities of the natural world. The stunning landscapes of the NamibRand Nature Reserve and the style and comfort of the Wolwedans camps provided the perfect ambience. 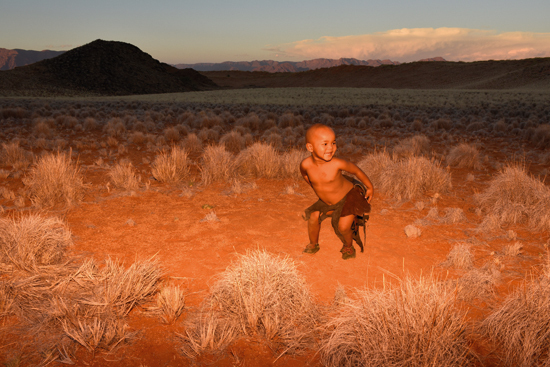 On NamibRand, you can even adopt a fairy circle to help fund and further the cause of both science and conservation. And once you have spent some time out there within that special mix of dunes, plains and mountains, of colours, desert winds and vastness, it is easy to imagine that the forces that shape this wonderland include the odd sprinkling of inexplicable magic.